Reliance Jio’s Summer Surprise Offer was a great success but unfortunately, it was revoked after TRAI advised Jio to withdraw the 3 months complimentary benefits of JIO SUMMER SURPRISE. 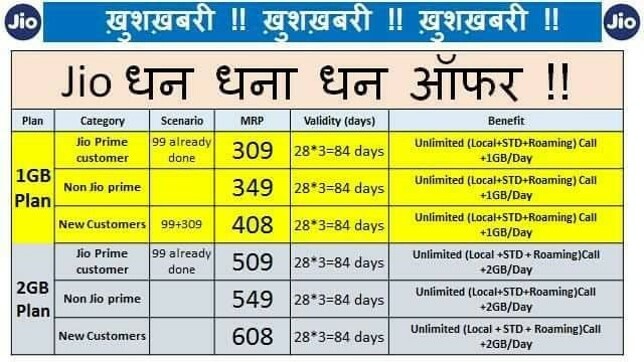 Now Jio is soon going to announce the Jio Dhan Dhana Dhan Offer with which prime users will get Daily 1GB Data for Rs 309 and 2GB data for Rs 509 for 84 Days. As per the offer, Jio Prime members will get 1 GB unlimited 4G data per day for ₹309 along with unlimited voice calls with a validity of 84 days. However, those who are not enrolled in Jio Prime can get the same benefits by doing a recharge of ₹349. Besides, new customers will have to do a recharge of ₹408 to get these benefits. As far as 2 GB plan is concerned, Jio Prime members will get unlimited 2 GB 4G data per day for ₹509 along with unlimited voice calls and validity of 84 days. However, the same benefits can be availed by non-Jio Prime members by doing a recharge of ₹549 and by new customers for ₹608. Reliance Jio has listed Rs 309 and Rs 509 Plan on Jio.com which is now removed Jio Dhan Dhana Dhan Offer details have been shared with the mobile retailers, we are expecting Jio to make the announcement within a day or two.